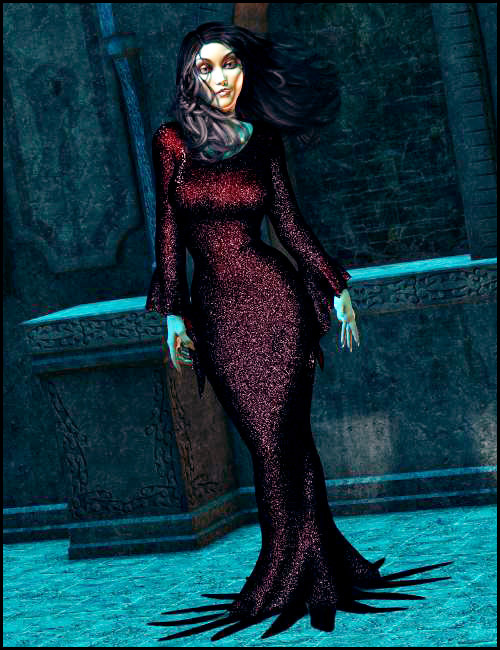 Back in 2007, while Maelwenn was working on what would become her Mortella character, she approached me asking for advice on finding a “Morticia Adams” style dress. I offered to create a dynamic one for her, so she could use it in promos, and forgot about it. The request for that particular dress has haunted me through several incarnations of the DAZ forums and elsewhere ever since. Finally, I’ve managed to find not only the original .obj, but also the original Cinema4D files saved during the modelling process. This has made finally releasing the dress a reality. The zip file includes the dynamic dress as a prop, a readme file with suggested settings, a link to my tutorial on this website on using dynamic clothing, a pdf with further explanations on using dynamics, and the dress’ template. 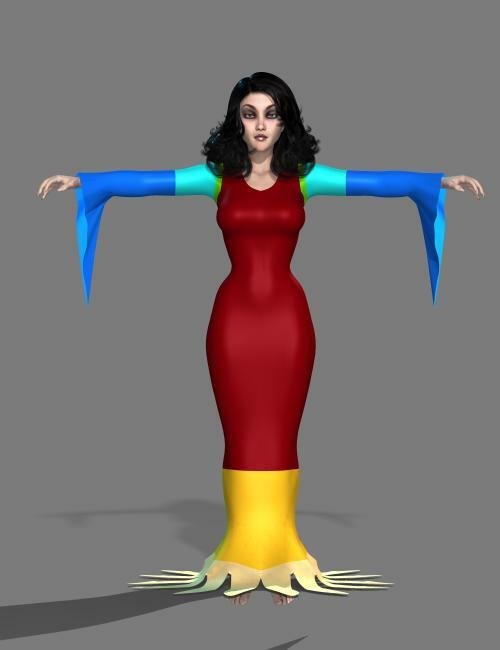 This dress only works for the Mortella character for Victoria 4, and will only work in Poser 6 and above, as it is 100% dynamic. This dress will not work in DAZ Studio, and it is not possible for me to do a dynamic version for it, as Studio requires proprietary software. Also, unlike Aiko Eve or Cherubim, this dress will not get a conforming version, as the tightness of the skirt makes it extremely difficult, if not flat out impossible, to rig it in any manner that would be accepted by any store’s QA process. UPDATE: thanks to Puntomaus, there is now a refit and basic rig for Genesis. Download from the link below and enjoy!